Since I was staying at the Casa dela Playa in the off-season, got a surprise bonus from Emely, the owner of the resort. I got a free guide/driver in Hans, a German transplant to Siquijor. We were a curious pair - a towering German and a stocky Pinoy backpacker/photographer. 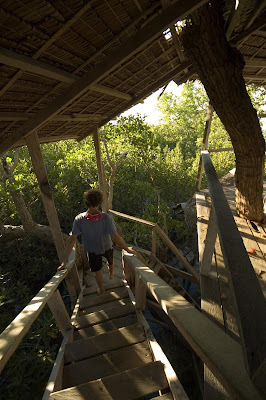 He showed the way through the mangrove sanctuary of Tulapos in my first afternoon in Siquijor. I wouldn't know there was a tree house there if it weren't for him. The next day, went back there on a whim with Dennis, the habal-habal driver I befriended at the Siquijor pier. 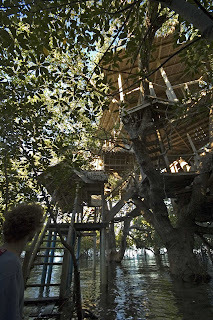 Even he had no inkling there were tree houses hidden in the thick mangrove forest. Splish-splashing in knee-deep waters, I can hear fishes splish-splashing in our wake. That's how clean the water is and how vital the mangroves are. ferdz, sarap balikan nga in the early morning para makunan with the sunlight streaming through the mangroves.